When Can Infants Eat Deli Meat? The 4- to 6-month mark, when most babies begin eating solid foods, is an exciting time for parents and infants alike. Not only can your little one start eating with your family, but you can share your favorite foods with him. Not all foods are safe at this stage, though, and most babies won't be ready for table foods -- such as deli meat -- for several more months. Although deli meat can be part of a well-balanced diet for your infant, it's important to understand its benefits and drawbacks. It's fun to introduce your baby to new foods and watch her reaction, but it's important to wait for the right time. Your infant might be ready for meats at 6 months, but Medline Plus suggests introducing them at around 8 months of age. Introduce meats with foods your infant has already tried. This way, if signs of a food allergy crop up, you'll know which food is the likely trigger. Finely diced or chopped meats are your best bet to reduce the risk of choking. 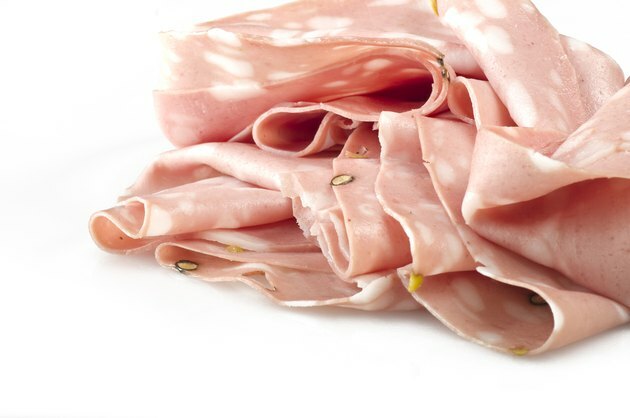 Deli meats are easy to chop into small pieces, making them a good option for new eaters. HealthyChildren.org, a website from the American Academy of Pediatrics, recommends cutting all foods, meat included, into pieces that are 1/2-inch or smaller. Use a small knife to dice your baby's deli meat, or simply tear it into tiny chunks with your clean fingers. When you first introduce deli meats to your baby, scattering a small amount on his high-chair tray or plate is a good way to let him sample this new food. Serve it with crackers, cheese, and fruits and vegetables, all cut into appropriately sized pieces, for a well-rounded meal. As he gets older, has more teeth and is better able to chew and swallow, layer deli meat on bread with cheese for a lunchtime sandwich. Stir diced deli meats into pasta or vegetable soup or add it to a cheese pizza. Cut into small pieces, deli meat is a safe food for most babies to eat. However, it might not be the most nutritionally sound choice. While it's probably fine to feed your infant deli meats from time to time, fresh meats are higher in nutrition. Deli meats contain some protein, which is vital for adequate growth and development. However, they also contain a fair amount of fat, which might contribute to unhealthy weight gain and heart disease down the road. They are also typically high in sodium. Serve deli meats in combination with fresh chicken, beef, pork and fish for the most health benefits.